Biel/Bienne (Switzerland) – February 26, 2018 (travelindex.com) – Five years after unveiling Ahton, his now legendary sculpture, master jeweller Andreas Altmann is applying his creativity and expertise to watches suffused with Haute Horlogerie. Timepieces that appeal not only for their style but also their watchmaking mechanisms. Like an extension of the Giberg Swiss Noble Forge, the new Giberg Haute Horlogerie brand is an elegant demonstration of its mastery of time, just as Ahton was proof of its artistic dexterity, and is a worthy guardian of unique expertise. 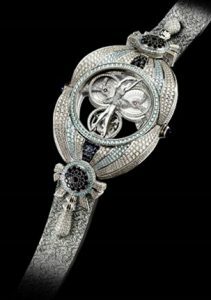 Andreas Altmann’s exceptional and original watches will be unveiled at the forthcoming Baselworld show.